The Guernsey Table Tennis Association Island players will return to British National League action this weekend to compete in the opening weekend of the 2015/16 Senior British League campaign under the guise of Ravenscroft I and Ravenscroft II. This will be the 3rd season of sponsorship from Ravenscroft and The Association is once more sending 2 teams to compete in the UK competition, which continually proves to be an important tool in the constant development of the Island’s top players. This was particularly evident in the summer when the Island elite managed to secure team gold in the Island Games. Ravenscroft I will be plying their trade in Division 3 North after their promotion from Division 4 North last season, whilst Ravenscroft II are moving into that spot in Division 4 North this season, after having competed in Division 4 South last time out. For the first time in history, both local sides will be competing at the same venue for the duration of the season. 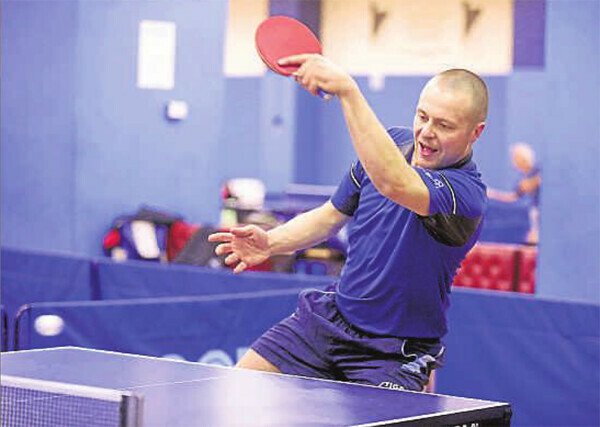 The venue for the 1st, 3rd and 4th weekends of action is Oldham Table Tennis Club, whereas the play will be contested at Derwent Table Tennis Club at York Railway Institute in York solely for the 2nd round of matches at the end of October. The Association has selected teams for the entire season once more and there will be a welcome return to the Island British League squad for the reigning CI Open Top 12 Champion and 5 time CI Men’s Singles champion Garry Dodd (pictured). Dodd completes an almost unchanged line-up for Ravenscroft I, with Alex Robinson, Joshua Butler and Joshua Stacey maintaining their spots. The player to drop-out of the 1st team is Ben Foss, however he will play at number 4 for Ravenscroft II this season. Joining him are regular BL campaigners Lawrence Stacey, Paul Hainsworth and Liam Robilliard, all whom competed in Division 4 South for the second string team last season. In addition to the move from celluloid balls to plastic balls, there has been a change made to the Senior British League format for the first time in recent memory. Previously each player competed in 2 singles matches meaning that 8 matches were contested during each fixture, however 2 doubles matches have been introduced this season. The additional 2 fixtures will hopefully prove fruitful for the Island as doubles is not played as regularly in the UK as it is locally. The doubles matches occur during the middle stages of the match and combinations can be named at any point prior to the start of the 1st doubles match. The only rule is that the player ranked at number 1 in each team must play in ‘Doubles 1’, being the opening doubles match. It is always difficult to predict at this stage who will be the strongest contenders in each Division as a lot can depend on which players turn out for each club on any given weekend, however there will be some familiar faces for Ravenscroft I. Warrington TTC and Rotherham Scorpions II both competed in Division 4 North with the Guernsey side last year and with the inclusion of Dodd, the Sarnians will be looking at gaining further promotion this season to Division 2. Ravenscroft II will be competing against a lot of teams familiar to Ravenscroft I from last year and will also be hoping to push for promotion into a higher division. North Ayrshire II could be an extremely tough prospect if Sean Doherty and Craig Hardie have any part to play. Both players are former Scottish Junior Internationals and are currently ranked at 7 and 12 in the Senior Scottish rankings respectively.